Book 20 of 2015 is a book based on my favourite opera Salomé by Oscar Wilde. To say I love everything Wilde has ever done is an understatement. He was an amazing mind and a broken soul and if that relates to anyone, it really does me. 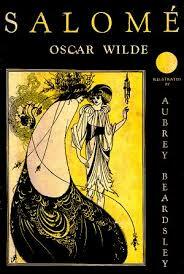 Wilde's interpretation is different and brilliant. It is a short read and of course, if our French is any good then it is wonderful. If you choose English then is is still fricken awesome. 3.5 heads out of 5. Should I read this? If you love Wilde or you love this opera then yes. What did I learn? Chicks be crazy when the guy looses his head first.